I may be delving into semantics here, but i’ve been thinking about the granular nature of social systems, and playing with something of a taxonomy. This is prompted because i realised i had started using the word ‘tribe’ a lot recently, when describing the Trust work, and in my explorations of complex social systems, and i was challenged on it. Someone asked ‘are you using ‘tribe’ interchangeably with ‘community’’, and i realised that i had no answer. I am simply using language that ‘feels’ right. So let me unpack that a little. One thing i feel confident about is that social systems don’t scale like formal systems: instead, they scale in a granular way. Tribes upon tribes. But what is a tribe…? I’m using the term to describe strongly trust bonded networks. They are probably most tightly structured around charismatic, individual power, with some emergent social hierarchy. For my purposes, i think that tribes are the minimally reduced functional unit of organisation. I wrote about these a couple of days ago, when i described ‘primary cultural alignment’, which is probably the formation of, or induction into, that local tribe. We can perhaps describe ‘community’ as a feature of one, or multiple aggregated, tribes. Or, rather, elements of different tribes. So a tribe may be a community, or multiple tribes may lend individuals to form a community. Possibly the second is more likely, as we seem to belong to multiple, overlapping, tribes and communities, taking different roles in each. Which may just loop me around to where i started: the problem with subjective constructs is that they are subjective. Maybe i would be better describing ‘types’ of relationship: tribal relationships are trust based, formed through engagement rituals, held with individual/charismatic power, bonded with shared trust. Community relationships are around shared values and purpose, are possibly meta-tribal, inter or intra tribal, possibly more transient? And maybe the aggregation of all fo these is ‘Society’, bonded at some level, although increasingly i consider national Society as little more than geographically bonded with shared and fractured heritage. I certainly feel that ‘society’ in national context is increasingly outdated in a globally connected world. So, forgive my record breaking use of the words ‘possibly’, ‘maybe’, and ‘perhaps’: i am simply reflecting on structure, not sharing anything i think is correct yet. The bottom line, for my own work, is this: i feel the narrative around ‘tribes’ sits ok alongside the discussion of ‘communities’. They may be one and the same thing, in different contexts, or perhaps they represent my understanding of taxonomy, but for now, it’s enough that it helps me to move my narrative forwards. This entry was posted in Community and tagged Community, Culture, Society, Taxonomy, Tribes. Bookmark the permalink. 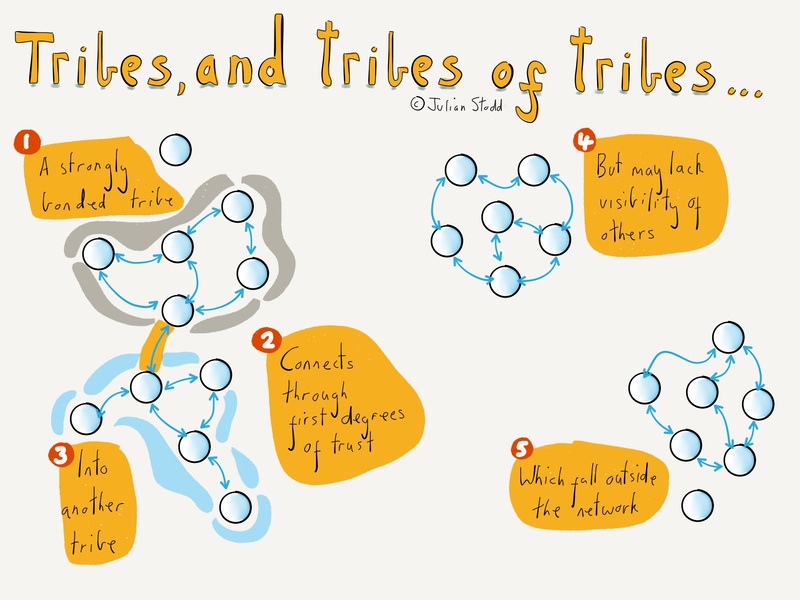 I would view ‘tribe’ as a smaller subset of ‘community.’ Tribe sounds like family, and community sounds more like a loosely connected grouping. This fits in with your thought that a tribe is built around trust and tight bonds, where a community is built around a common purpose and might be more transient. I also think that tribe implies a strong emotional component that community may or may not have or need. It would be interesting to explore how that emotional component can lead to dysfunction within tribes that wouldn’t be experienced in the same way or felt at the same intensity in a more loosely connected community. 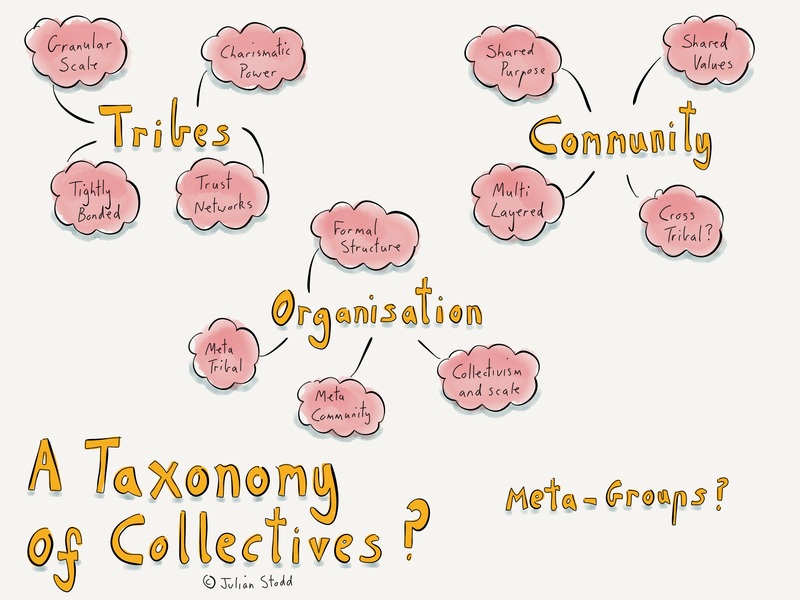 Hey Julian, i think tou are onto something with the scalability or lack thereof, the taxonomy reflection and the difference-making between tribe and community. It is a gut feeling, not quite explainable. But i do feel you are onto something bigger.